"This is such a wonderful book!" Never before has a minister of the gospel gone to such great lengths to meticulously record so many miraculous events: The blind see, the lame walk, and the dead are raised. Dr. Randy Clark shares the captivating results of global healing ministry and provides links to video testimonies throughout the book. He also addresses the skeptics. Dr. Clark has gone to great lengths to follows up months later with each person to verify the healing. Eyewitness to Miracles is endorsed by university scholars and leaders from a variety of church backgrounds—Anglicans, Baptists, Catholics, and Methodists. After all, if Jesus healed people in his day, why shouldn't we expect to see people healed today? 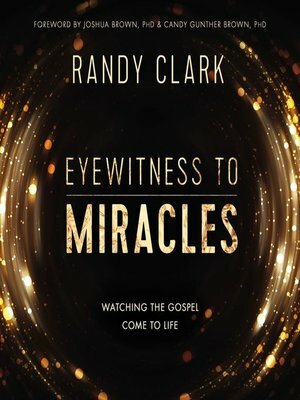 Eyewitness to Miracles is a remarkable read that will make you believe once again.